Dyscalculia is defined by Dictionary.com as: "Impairment of the ability to solve mathematical problems, usually resulting from brain dysfunction." It is probably as widespread as dyslexia and yet, curiously, is far less in the public awareness than its literacy cousin. Sometimes, the same person can have both dyslexic and dyscalculic symptoms. Other learners may, by contrast, have highly developed literacy but poor numeracy skills, or vice versa. Like dyslexics, dyscalculics often develop survival strategies such as rote learning techniques, "do-it-for-me" strategies and, of course, the pocket calculator. These serve to mask their learning difficulty from prying eyes. Generally speaking, there are fewer eyes prying at dyscalculic difficulties than at dyslexic difficulties, so the strategies tend to work. Dyslexic and dyscalculic learners have several perceptual abilities in common, one of which tends to be proficient non-verbal thinking (“thinking in pictures or with feelings”). In order to understand and solve mathematical problems, the dyscalculic learner needs to have a clear mental image for the meaning of every symbol that the problem contains. Literacy pupils are frequently taught the "alphabet song" as a means of memorising the alphabet. In later life, dyslexic learners frequently find themselves dependent on this technique as a “prop” whenever they need to find an entry in a dictionary or telephone directory. For the dyscalculic learner, the times tables can serve the same function. It is possible to rote-learn times tables, thereby giving the impression of "knowing" them, without having any understanding of the reasons why they are true. To the observer, the rote-learnt information masks the underlying learning difficulty. But the difficulty is still there. All mathematical symbols and functions are rooted in foundation concepts which constitute the very fabric of our universe. In a Davis Maths Mastery Programme, we start with a creative process called Davis Concept Mastery, with which we work through the concepts of change, consequence, cause, effect, before, after, time, sequence, order and disorder. Every one of these concepts is essential to a person if they are to fully understand the nature of mathematical truth. When a person has fully mastered the basic arithmetical functions and can interpret a maths story problem with ease, a Davis Maths Mastery Programme has achieved its goal. Yet clay-based learning does not have to stop at the point when a learning difficulty has been resolved. 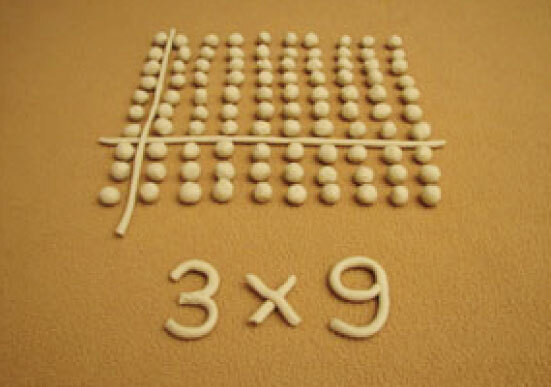 All learners can benefit from experiential mastery of some of the more advanced mathematical processes, including algebra, number bases, and factoring quadratic equations.